"San Diego Global Forum: Japan-U.S. Relations Going Forward"
Former Minister for Foreign Affairs and Minister of the Environment in Japan, the Honorable Professor Yoriko Kawaguchi shared her views on Japanese-U.S. diplomatic relations with regard to the economy, the environment, and geopolitics and Asia going forward. Following her presentation, Professor Ulrike Schaede led a conversation on how these matters affect global trade and San Diego. Yoriko Kawaguchi is a professor at the Meiji Institute for Global Affairs at Meiji University, as well as Japan’s former minister for foreign affairs (2002-04) and minister of the environment (2000-02). She also served as a member of the House of Councilors for Japan’s Liberal Democratic Party, as co-chair of the International Commission on Nuclear Non-proliferation and Disarmament and as a special adviser to Prime Minister Junichiro Koizumi. 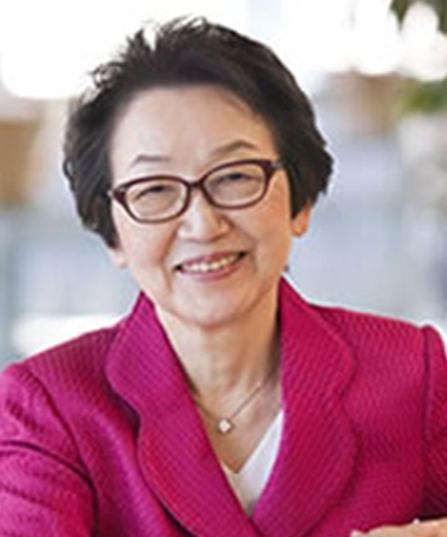 In addition, Kawaguchi has worked as an economist for the World Bank and as managing director of Suntory Holdings Ltd.
During her residency, Kawaguchi provided a public talk as part of the San Diego Global Forum, discussing Japanese-U.S. diplomatic relations regarding the economy, the environment and geopolitics. She also led discussions with students and faculty on the challenges women face when participating in foreign affairs and policymaking in mostly male environments. While in San Diego, she visited Qualcomm Inc., UC San Diego’s Energy Innovation Park, Kyocera Corp. and — to fuel her interests in sustainability and the environment — Ecoparque in Tijuana, Mexico.